This lively historical adventure, based on the real life of a young woman from the village of Kritsa in Crete, depicts her rebellion against Ottoman oppression. Rodanthe, the feisty daughter of Kritsa’s pappas (priest), spent her childhood longing for her father’s approval without appreciating his efforts to keep her safe under Ottoman oppression. Years later, the ruling Pasha orders Rodanthe’s kidnap intent on making her his wife. Determined not to yield, Rodanthe tricks the Pasha and then flees to the mountains dressed as a young man. After joining rebels as Spanomanolis (Beardless Manolis), she draws on her unusual experiences and rare education to maintain her disguise throughout daring raids. Now, honoured as Kritsotopoula (Girl of Kritsa), villagers celebrate Rodanthe’s exploits annually in front of a poignant stone carving. This monument portrays the moment in 1823 when brave Rodanthe’s secret was exposed – a point mirrored as this story culminates with a twist. Infused with myths and local flavour this historical adventure gives insight to customs that still shape many lives in Kritsa today. To buy the paperback or ebook from your ‘local’ Amazon CLICK HERE. 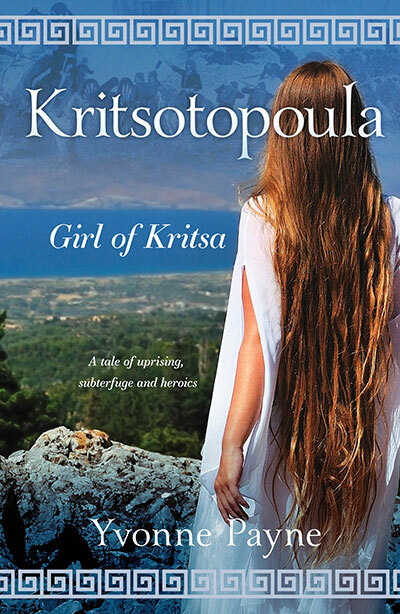 Kritsotopoula, Girl of Kritsa is also available as a paperback in Crete. I’m delighted that Eklektos Bookshop in Elounda has my novel on sale. The shop owner, Lynne will even make you a cuppa while you browse! The book is also available in Kritsa’s upper high street, named Kritsotopoula Street. This photo shows me with Nikos outside his gift shop, opposite Arisitidis Cafe. It’s on my Kindle now!!! A friend from Kritsa has relocated to Spain so I passed on details of your magazine. Just ordered your book. Am intrigued with the plot and look forward to reading it.